A couple weeks ago for The Weekly Art Challenge, I posted an unfinished drawing of a mother and child. A portrait of a very close friend’s sister-in-law and young nephew. It was far from completion and something I worked very hard on for about three weeks. Finally I completed it and thought I should share the outcome. 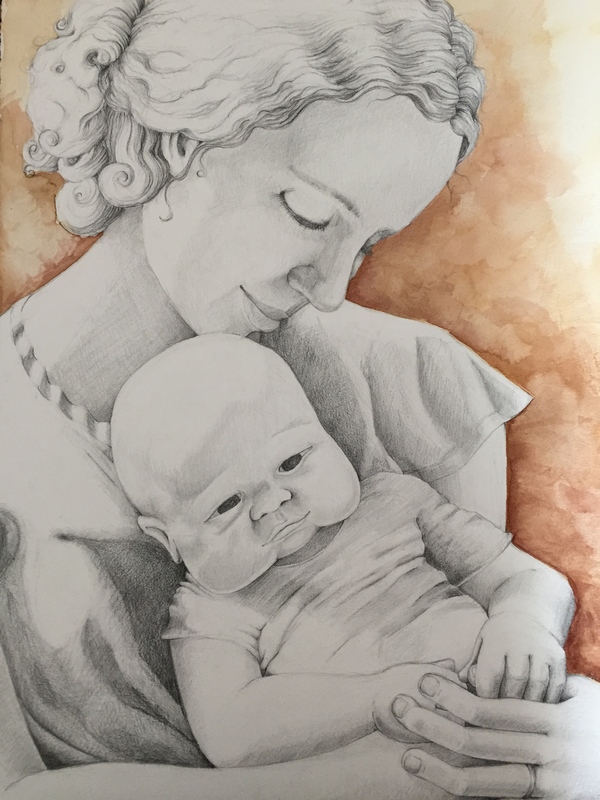 When I started the piece I had all sorts of whimsical ideas from floral backgrounds to, what would be for me, a challenging style and painting application; but in the end I choose a more classic style to capture the motherly tenderness I saw in my friend’s photograph. The color in the background is a reference to her auburn hair and fondness of Japanese Maples. I mixed several warm earthy reddish tones together and applied the wash in multiple layers, often using tissues to gently remove color and create a dreamy intimate space for the figures. The mother in the image will not receive her portrait until the holiday, and I am eager to know if she likes the piece. I sincerely hope she does, at the moment this is my favorite piece in my portfolio. You can visit my Etsy site if you are interested in commissioning a similar portrait for your loved ones. Something new I have been working on! A portrait of my niece. It is not completed and there are no other photos except for this one. I had purchased a good sheet of strong watercolor paper ( Arches 300 LB 22×30) and intend to work in watercolors with the tea and graphite. 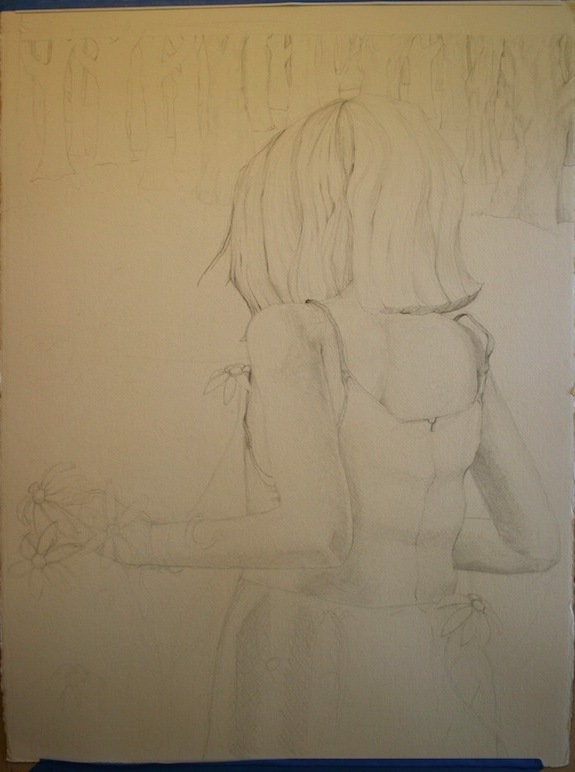 I am wanting to challenge myself with this piece and really hope it turns out as I envision. I will post more when completed.